The Burford Holly was discovered in Atlanta’s Westview Cemetery in the 1900s. This cultivar is one of the toughest of the Chinese Hollys available. 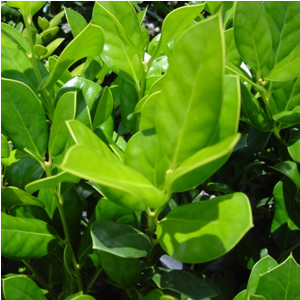 It is an evergreen shrub with glossy, stiff leaves with that cup downward, this cultivar has very few spines on the leaves. In the fall Burford Holly sets fruit, these are long lasting large red berries, and there will be a show every year because this cultivar does not need pollination to set fruit. Ilex cornuta ‘Burfordii’ grows 15-20 feet tall and it has a tolerance to heat, drought, and alkaline soil.